The Bloemfontein branch of Boston City Campus & Business College is offering a brand new course commencing 1 May aimed at assisting learners who are preparing for matric rewrites. The course provides learners with extra classes in their chosen subjects as well as providing them with guidance on how to study effectively. ‘One of the main reasons why learners struggle with matric, would be because they do not know how to study. The new course includes a free module on study and life skills that will help students to master the art of studying and help them manage their time and life more effectively whilst preparing for exams,’ says Beyers Schoeman, Principal of Boston Bloemfontein. Students are only allowed to rewrite two subjects per year so the course will focus on those two particular subjects. Schoeman explains that the methodology chosen by Boston is very supportive with each student having an academic coach that will ‘hold their hand’ throughout the programme. ‘The coach will be able to assess where the learner is having difficulty and suggest more exercises in that particular section. Learners will also have to complete past papers, which the academic coaches will mark and then discuss in detail with them,’ adds Schoeman. Furthermore parents will also be involved in the process and will be given regular feedback about the progress of their children. In order to enroll learners must be able to use the internet and must have submitted the necessary documentation to the Department of Education (DOE) and be registered with the DOE. The course is only available at Boston City Campus & Business College Bloemfontein, 107 St. Andrew Street, Bloemfontein. Boston is committed to “Education. For Life.” and prides itself on offering relevant courses that meet industry needs; quality academic material and tuition that deliver a high level of success for students and provide them with employable, work-ready skills. At Boston you are offered assistance with career counseling and its doors are open to the public to sit for a career compass assessment to discover your interests, talents and skills in order to make an informed career choice. 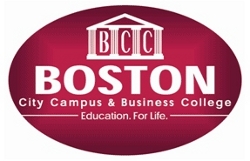 Boston City Campus & Business College Bloemfontein guarantees a warm welcome to all and will answer all your questions. For more information or payment options contact us directly on 051 447-5700 or visit www.boston.co.za.